Partitioning allows you to make the best possible use of your available space, providing a flexible and changeable solution to the layout of your office or commercial environment. Stodec Products manufacture a wide range of high quality commercial partitioning options, including office partitioning, single and double skin industrial partitioning, steel partitioning and mesh partitioning. 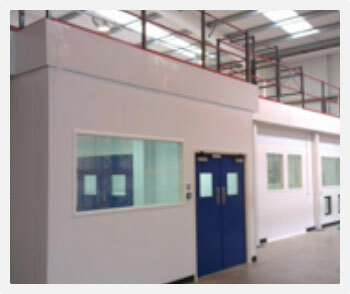 We can provide specialist cleanroom partitioning using the Titon system, tailoring the products to the bespoke needs of this environment. Our expert team are available to carry out free site surveys, assessing your partitioning needs before designing, delivering and installing all materials. This means that you will receive the highest standard of service from a company with over 30 years of experience at the forefront of the industry. Mediplus are an Industry award winning company focused on the research, development, manufacture and marketing of innovative medical devices that meet the needs of patients and clinicians worldwide. Previously they had their product packing outsourced and with sustained growth, decided to expand and carry out all operations in house. Stodec Products Cleanroom Division was chosen for the design & installation of this prestigious project on a competitive tender basis and after viewing previous projects.